Will Rhodes is a travel writer whose job brings him to exotic destinations and in touch with influential people. Early in the story, he is off getting himself permanently compromised and ripe for blackmail in Argentina, where he is forced to become entangled with some international spy network. 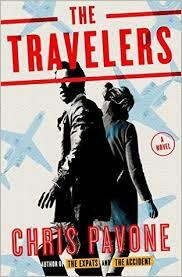 Some of the people in this book do have espionage connections, but Pavone doesn’t things that simple. The reader and Will Rhodes alike must sort out the real agents from the impostors. At the magazine, there is editor Malcolm Somers, whose furtive activities include something shady with Will’s wife Chloe, who after leaving the magazine, begins pursuing her own furtive career. A former editor has disappeared. A shady group monitors the moves of a number of people, including some of the staff at the magazine. The idea of spy thriller set in the publishing world is clever but lagged in the execution. A travel writer’s life lends a good cover for spying, but as Will Rhodes becomes entangled in this global intrigue, the story actually falls flat because it is over-written, feels too long and meandering. The self-indulgent ruminations really slow the pace, so much that it takes 351 pages to convey what I have figured out at about page 100. The saving grace is the final third, when Pavone pulls together the many threads, connecting characters that seemed unrelated to the plot and stepping up the tempo. The Accident is a thriller about publishing. It concerns a manuscript by an anonymous writer that is so earth-shattering that people in the publishing world would kill to get their hands on it. The manuscript is sent to Isabel Reed, a New York literary agent renowned for her discretion. She knows how delicately the book needs to be handled. So while she pitches the manuscript to the best editor she knows, Jeffrey Fielder, the proof, also titled “The Accident,” has already gone into covert circulation. Her assistant read it secretly and blabbed drunkenly to her friends and posted about it on Facebook. It has even been photocopied by a subsidiary-right person hoping to see it in Hollywood. This means great danger to anyone who has come in contact with the manuscript, let alone Isabel herself. Everyone sees the bombshell of the manuscript is the opportunity for a break. The publisher sees it as the life-saver to a company teetering on the brink of bankruptcy. All of which brings reader to Charlie Wolfe, a man who is the subject of the manuscript. His own media empire sustains on “de-newsing” the news, with a content bias toward gossip, innuendo, voyeurism and scandal. It pinches CIA’s nerves that exposure of Wolfe’s malpractice, which helps further the cause of the USA more or less, would compromise national security. So the book proceeds with twist and turn galore. The unfortunate thing is that it’s easier for Pavone to conjure up shocking dramatic turns, abrupt killings, and unexpected connections than it is for him to come up with anything truly damning about Wolfe. The so-called secret is nothing but hyped. That said, The Accident is filled with keen, bittersweet observations about the publishing world. It pays tribute to the permanence of written word and the printed matter—that there is a validation, a legitimacy conferred by having a story out there in a physical form. 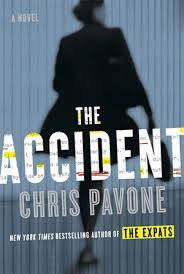 For a debut in the literature of espionage, Chris Pavone, a book editor for twenty years returning to New York City after an expat sojourn in Luxembourg, sets the bar really high. The book is electric and addictive. In Kate Moore, whose life pervades with deceit and secrecy, Pavone has created a startingly real and unforgettable heroine, who is a mother, wife, and ex-CIA operative. When her husband Dexter, a computer network security specialist, is offered a lucrative contract, Kate cut short her 15-year career and jumped at the chance to leave behind her double life and started anew in Luxembourg. Though discharged from the intelligence bureau, her sense of alert and natural acumen still reign. The arrival of an American couple, Julia and Bill Mcleans soon ruffles her and grates her nerve: They are not who they claim to be. Innately distrustful and professionally suspicious, she immediately knows they are involved in some covert behavior. Could they be assassins coming to revenge over her botched operation of a Latin American leader? Meanwhile she realizes her husband might be more clever, deceptive, and dubious than she has always believed. Over the years the things unsaid between Kate and Dexter were large beyond comprehension. Now the lies and secrets are accelerating, becoming what define their marriage. But she cannot broach about these suspicions without admitting that she was CIA. 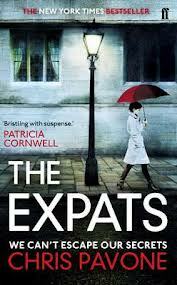 The Expats is intricately and meticulously plotted. The book is entertaining enough to kill time with as one is immediately drawn into the multiple facets that drive the story forward. Yes, there are selfish pursuits, ill-begooten triumphs, and very repulsive humanity involved. All these are not fully revealed until the end. Pavone never lets slip his portrayal of Kate and her quest to find meaning in her charade of an existence, which makes the book very powerful. As each pursues different conjecture, every turn of the page is a total paradigm shift as a result of many double crosses and unanticipated twists.